The Lois B. Small and Gladys B. Hamilton Labyrinth is modeled after the medieval 11-circuit Chartres Cathedral Labyrinth in France that was built nearly 800 years ago. 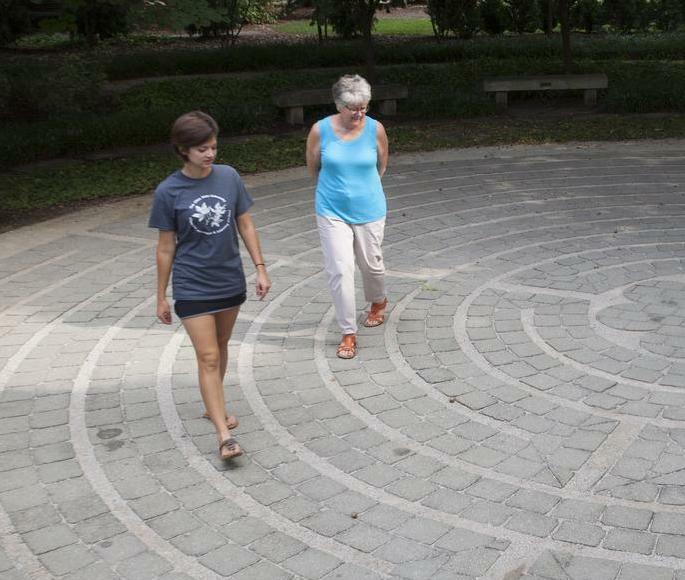 The labyrinth was made possible through a generous gift from Dr. Edwin B. and Nancy S. Hamilton in loving memory of their mothers, Lois B. Small and Gladys B. Hamilton. It was dedicated July 16, 2000, and has become a very popular tour destination since then. A revival of labyrinths began just a few years ago. The Lois B. Small and Gladys B. Hamilton Labyrinth is part of that revival. 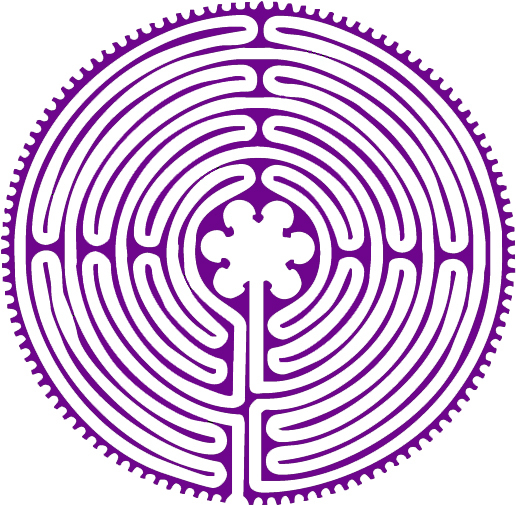 A labyrinth is a one-way path that is laid out for contemplative walking, typically leading from an entrance to a center. In general, there are distinct patterns and elements of symmetry present. In any part of a labyrinth the view allows for a visual appreciation of its patterns. The function of labyrinths has been largely ceremonial, although they are not restricted to this use. Labyrinths have been used for spiritual purposes in the great Gothic cathedrals of Europe, as magical talismans by fishermen in Sweden, and for fertility rituals by pre-Christian agrarian societies. 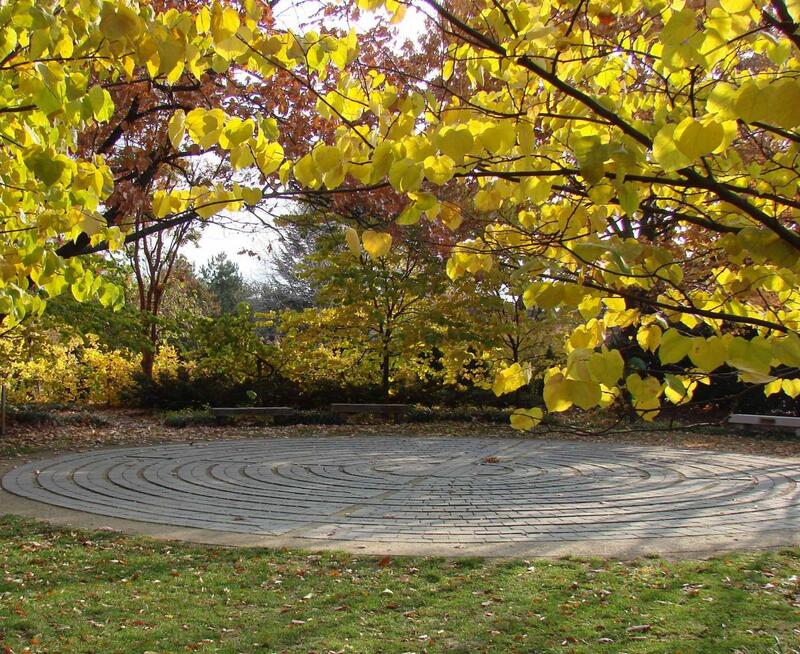 The labyrinth symbolizes the cyclic journey that each of us must take daily, seasonally, in life, death, and rebirth. A design charette was hosted by Chadwick Arboretum in 1997 to determine what could occupy this particular space in our gardens. A design charette is a multiday, highly structured and facilitated working session. The term is borrowed from the architecture field and refers to a collaborative session where a group drafts a solution to a design problem. Our challenge: Chadwick Arboretum needed a hardscape which could be enclosed and/or tented for special events and still provide a unique feature for our gardens, attracting a wide variety of visitors. 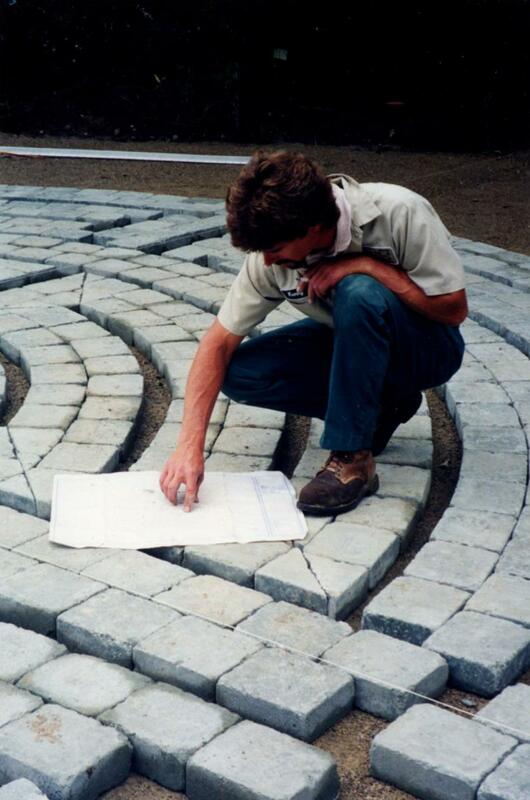 In the waning months of 1997 the first phase of our labyrinth and surrounding gardens were installed based on a design by Jon Carloftis, a widely recognized garden designer. Jon was one of nine designers and artists who participated in the Chadwick Arboretum design charette. His design for the Arboretum, including the labyrinth, served our two defined purposes: it created an interactive destination point in the Arboretum and provided an enclosed area for private receptions/events in the Arboretum. During a walk on the labyrinth, which typically takes about 20 minutes to complete, the mind quiets, the breath slows and time stretches out. Much like swinging in a swing, walking the labyrinth can provide a centering experience, just as it has in its various forms – Classical, Roman, Medieval (Chartres style), or Contemporary – for about 4000 years. 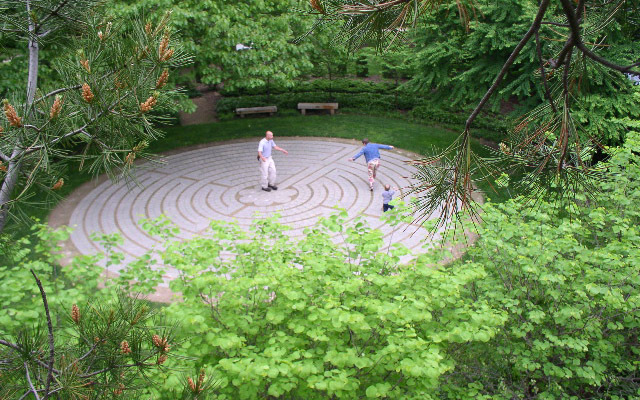 The labyrinth can be used as a path for prayer and meditation. It can also be used as a tool of discernment by considering your experiences on the metaphorical level. Walking the circular pathway can result in an increased sense of balance and well being. One reason may be that the path forces one to follow curves of varying length, interspersed with sharp, 180-degree turns. For example, you might walk to the right for a short distance, then turn and walk in the other direction perhaps for a longer distance. This repetition is thought to have effects comparable to a physical workout, and enhances meditation. Another beneficial, physiological result of the many left-to-right and right-to-left turns experienced while walking the labyrinth is stimulation to the inner ear that can temporarily improve balance between the logical and artistic activities of the brain. To find additional labyrinths in central Ohio or anywhere in the world, consult the World Wide Labyrinth Locator website. 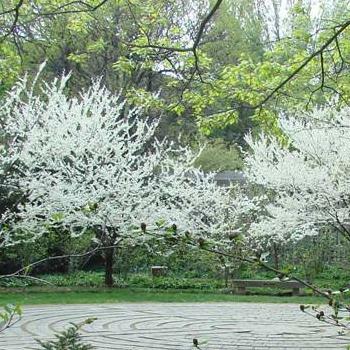 To provide a calming, quiet atmosphere, Chadwick Arboretum has created a white garden that encircles the labyrinth. White is both restful and restorative, while emphasizing a single color minimizes distractions and enhances meditation. Cercis canadensis is a popular, small, ornamental tree. These beautiful white redbud trees ring the labyrinth with a profusion of small white flowers on leafless branches in early spring followed by heart-shaped green leaves which turn yellow in autumn. Redbud assets include youthful rapid growth and vased growth habit, somewhat ornamental bark, and picturesque branching character with age. These assets are contrasted with its tendency to have a short functional service life of about 15 years in many urban landscapes. A graceful, elegant, though variable, species of shade trees, the katsura tree is characterized by blue-green foliage and, in the best of specimens, a yellow to scarlet color in autumn. When you approach is tree in the autumn, you might notice a more surprising attribute – the fragrance of cotton candy. Click Cercidiphyllum japonicum (katsura tree) or Cercis canadensis 'Alba’ (white redbud) for a photograph and one or more links to information about these trees from The Ohio State University Plant Facts, Wikipedia, and/or USDA Plants Database. Or click Plant Search Database and simply enter the botanical name (genus only will work) of any tree on The Ohio State University Columbus campus. If you do not know a tree's botanical name, you can find it by searching the web using the tree's common name. We are in the process of adding QR codes to our plant labels throughout the arboretum. If you are walking in the gardens and see a plant label with a QR code, use your smart phone or tablet QR reader app to access a photograph and description or link to additional information about the tree. If you don't have a QR reader app, you can download one for free from your app store.